With the upcoming launch of the Nexus Q, which lets you stream Google Play content to your TV or stereo, Google will compete more directly with Amazon and Apple in a media-store melee where price is taking a backseat to how and where consumers can play what they buy. Using both a computer and a tablet linked to each store, I checked out the online media markets run by these Internet behemoths. I used a Kindle Fire for Amazon's music and video stores, an iPad for Apple's iTunes, and an Android tablet for Google Play. I found, first of all, that Apple continues to have the biggest catalog of music and video offerings--more than 28 million songs and 45,000 for-purchase movies as of April, and more than 85,000 TV episodes as of last October. Amazon's MP3 store hosts more than 20 million songs, and an empty search of its Instant Video store indicates that it has more than 52,000 movies. It's difficult to gauge the number of TV episodes available there; the search shows more than 9000 TV titles, but titles may encompass entire seasons in some instances. Google is far less specific about the size of its catalog, but it clearly trails the other two. Publicly, Google says only that it has "millions" of songs and "thousands" of movies and TV shows. Prices for current releases were the same at all three services: You can rent movies in standard definition for $3.99 each or in high definition for $4.99 each, or you can purchase them for $14.99 (standard def) or $19.99 (high def). In the music markets, current albums go for $10.99 apiece and singles for $1.29 apiece. Nevertheless, I found considerable variation in the pricing of older movies, TV shows, and music. Google Play, for example, offers a free song every day (presumably to attract you to the store). Amazon Prime members can stream thousands of movies and TV shows to a computer, a Kindle Fire, an XBox 360, or another supported device free of charge: I used the service on a Kindle Fire to watch the 1954 version of Sabrina, which costs $2.99 to rent and $9.99 to buy on Google Play and on iTunes. Not all devices that support Amazon Instant Video also support Prime Instant Video, however. For example, my TiVo DVR, which offers access to Amazon Instant Video, can't stream Amazon Instant Prime content. Regardless of what you pay, you don't always get the same playback options--especially with video. For example, if you rent the film Mirror Mirror on iTunes, you have 30 days to start watching it, but once you start, you retain access to it for just 24 hours. Amazon and Google Play offer the same 30-day interval for initial access, but the window for watching it once you've started the video is 48 hours. These limits vary from title to title, in part because Hollywood studios dictate them--and the studios are still scrambling to figure out how best to monetize their content. More significantly, though you can instantly stream iTunes purchases to Apple TV, the iTunes store does not support instant streaming of content to iOS devices--iPads, iPhones, and iPod Touch players--which means that you have to download the (purchased or rented) content first. Both Amazon Instant Video and Google Play, by contrast, can start streaming purchased or rented content on compatible devices immediately. Even if a device doesn't support streaming of Amazon content, Amazon's download technology usually lets you start watching it within a few minutes, as it continues to download. Device support is a big differentiator. Amazon Instant Video is available on an impressive number of devices besides the Kindle (including computers, smartphones, tablets, set-top boxes, game consoles, and TVs); but you need either a desktop-grade browser or an Android device to watch Google Play videos. This holds true even for the Nexus Q, which requires an Android device to serve as its remote control. But even without a Nexus Q, you might be able to watch Google Play content on an HDTV if you have a device equipped with an HDMI output. To play videos from Apple's iTunes store, you need an iOS device--an iPhone, an iPod Touch, an iPad, an Apple TV, or a computer running iTunes. Apple also sells a $39 dock-to-HDMI connector that, in theory, lets you watch iTunes video on a big screen without having to invest in an Apple TV. But user reviews are decidedly mixed on how well it works. Options for high definition (HD) versus standard definition (SD) video vary, based both on device support and licensing considerations. Apple offers all videos in both SD and HD--if such versions are available from the content provider--because the iPad and current iPhones and Apple TV support both. 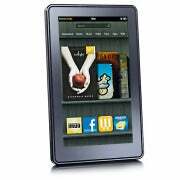 The Kindle Fire and most Android devices don't support HD video; however, on the Kindle you can still rent or purchase videos in high def when such versions are available, in case you want to switch to a device that supports HD playback. Google Play offers less HD content than its competitors. At this writing, for example, Google Play has no HD option for Mirror Mirror, which you can get in HD on the other services. According to Google's documentation, studio licensing agreements dictate HD availability. 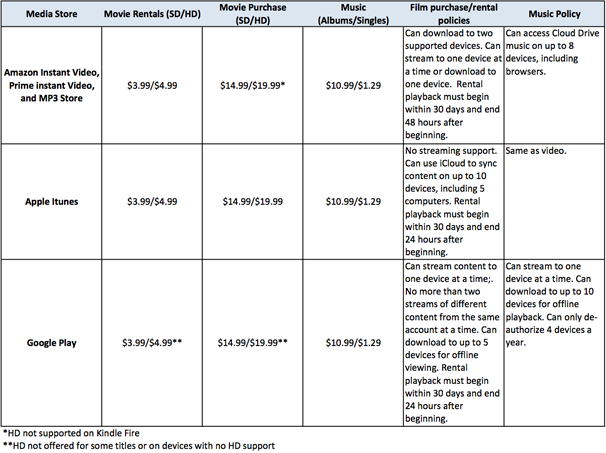 Finally, the services have different rules on how many devices you can use to watch media streams or to download content. Amazon's focus on selling content as opposed to hardware is obvious in the way it runs its media store. Customers can watch Amazon Instant Video on dozens of supported devices, some of which--including the Kindle Fire, computers, and the XBox 360--let you choose between streaming rental videos and downloading them for offline viewing. Customers who pay $79 for Amazon's Prime service, which offers free two-day shipping for all purchases, also get free Prime Instant Video access to streamed versions of some 13,000 movies and TV shows. Again, this service doesn't work with all Amazon Instant Video-compatible devices--for example, TiVo DVRs don't support Prime Instant Video. 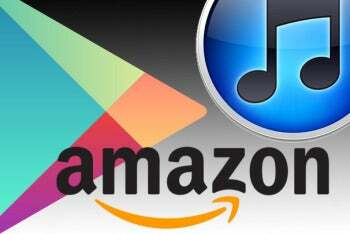 Amazon lets you download purchased content to two compatible devices. If you want a PC to be one of them, you must install the Amazon Unbox Player. You can make backup copies of your purchased videos on a PC, and Amazon recommends doing so to ensure that you can restore the content. Amazon does maintain your purchases in a so-called digital locker, however; as a result, if you run out of space and have to delete a downloaded video on, say, a tablet or a DVR, you'll likely be able to download it again. Amazon says that it can't guarantee that the content will be available indefinitely, owing to license restrictions "or other reasons." Also, you may have to initiate your download online: Though I can buy and download content on my TiVo by going through a registration process and getting a five-digit PIN to punch in whenever I want to approve a purchase, I must go to a Web browser to download items I've purchased online, or to retrieve deleted content from my digital locker. After downloading content to two devices for viewing offline, you must deactivate a license if you later want to download the content to a third device. Freeing up a license can be complicated--the process varies from device to device--and it may involve removing all licensed content, so read the online instructions carefully. Amazon restricts renters to a single download or video stream, but it permits users to stream two different videos simultaneously to a single account--a nice feature if mom and dad want to watch one movie and the kids want to watch another. Rental terms--specifying how long you have access to the video, and the duration of the viewing window once you start watching--vary depending on licensing agreements. The Kindle Fire doesn't support HD video, but it gives you the option of purchasing HD content in case you plan to access it later on a high-def screen. In my tests, the Prime Instant Video SD stream for Sabrina ran fairly smoothly, though not without occasional freezing and crashing. Amazon makes its video content accessible in two formats: H.264/AAC within a .mp4 container, and VC-1/WMV9 within a .wmv container. AAC video is best for Macs, while .wmv is optimized for Windows Media Player. Amazon handles music differently from video. 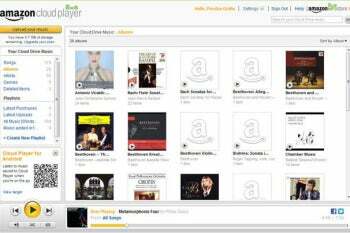 When you buy music, you can either download it or have it stored online on your Amazon Cloud Drive, so you can stream it from devices with the Amazon Cloud Player. 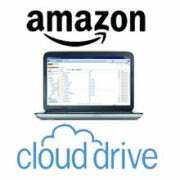 Amazon lets you upload your existing music collection to the Cloud Drive, to a maximum of 5GB of storage--and tunes purchased on Amazon don't count against that limit. Amazon says that, where possible, it encodes MP3s using a variable bit rate, aiming at an average bit rate of 256kb. You can access music on the Cloud Drive from no more than eight registered devices--and Web browsers count toward that total. In fact, if you clear your cache and discard the cookie Amazon gives you, the Cloud Player will count that sam browser as a new one the next time you use it. It's possible to unregister devices in your account settings, but you must call customer service to get rid of duplicate versions of a browser that count toward the device limit. If you you want to download your music purchases, you'll need to install the Amazon MP3 Downloader to your computer. It is essential for downloading more than one file at a time, and it can import your downloads to either your iTunes library or your Windows Media library. But if you lose a downloaded MP3 file, Amazon won't replace it. Apple iTunes Store: Biggest, But Not Best? Apple pioneered the online media store when it launched iTunes, and the breadth of its content offerings is unmatched. But the features in the current version--iTunes 10--are starting to look a bit dated. Most notably missing is support for streaming purchased content to iOS devices. When you buy a song or a video on your iPhone, iPad, or iPod Touch, you must download it to play it, and that can take a while. Apple TV does let you stream iTunes purchases instantly, however, and several third-party apps promise to add streaming support to iOS devices. Otherwise, Apple--the only one of the three stores reviewed here that requires you to install desktop software--treats purchased music and videos fairly consistently. You can store iTunes content online using iCloud and sync it to as many as ten authorized devices, including five computers. De-authorizing a device from within iTunes on a computer is easy. Purchasing videos from the iPad iTunes app requires only entry of your Apple account password. Once content finishes downloading, it appears in the appropriate player (music or video). The new kid on the media store block, Google Play doesn't yet have the volume of content (especially HD movies and TV) or ubiquity of device support enjoyed by its competitors. But if you happen to own an Android device of fairly recent vintage, acquiring content via the Google Play Store app is as easy as doing so on the iPad or the Kindle Fire. Simply maneuver to the appropriate content category, and search or browse as you prefer. The Play Store charges purchase or rental fees to the credit card that you have on file for all your Google purchases; if you don't have credit card data on file yet, you'll be prompted to add it. 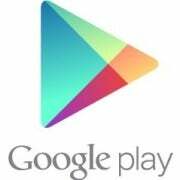 Music that you buy from Google Play automatically goes to your online Google Play library, and you can stream it to any Android device or browser. You can also upload up to 20,000 songs from other sources to the library via Google's free Music Manager software, which makes the service great for streaming your tunes anywhere. But you can stream music to only one device at a time. You can also opt to download purchased tunes to up to ten authorized computers or Android devices for offline playback. If you run up against the ten-device limit, you can de-authorize a device and then add a new one--but you can't do this for more than four devices per year. Download limits are less generous for movies and TV shows: You can download them to only five devices, and you must delete the download on one device if you wish to view it on a sixth screen.